Oct. 25, 2016--We generally think of oil being accidentally spilled, but there are situations when oil might be intentionally spilled. Historically, ships at sea have sometimes intentionally dumped some of their cargo to save the ship and perhaps prevent a complete loss. However, this is a thorny area of maritime and environmental law, made even more complex by the engineering stresses on a foundering vessel and the political dynamics underlying a decision to intentionally dump oil. On March 18, 1973, the tanker Zoe Colocotronis ran aground on a reef 3.5 miles off the southwest coast of Puerto Rico. The master unilaterally ordered cargo from the forward tank jettisoned to help get the vessel off the reef, and 1.5 million gallons of crude oil were intentionally released. The tanker was refloated with the remaining 6.3 million-gallon cargo, but the captain was later convicted for multiple violations. When the Argo Merchant ran aground on Nantucket Shoals in 1976, jettisoning was suggested but rejected. The vessel eventually broke apart and the entire cargo was lost. In 1996, the U.S. National Academy of Sciences developed a lengthy report, “Purposeful Jettison of Petroleum Cargo,” to clarify when such a drastic measure might be the best way to prevent a larger spill. Aircraft in distress may also sometimes intentionally jettison fuel to reduce landing weight. Even though the dumped fuel is thought to vaporize rapidly, this technique is rare, in part because of environmental concerns. Dumping oil at sea hasn’t always been prohibited. In fact, steamships and lifeboats were required to carry equipment to slowly release oil (generally vegetable or fish oil) at sea during storms. 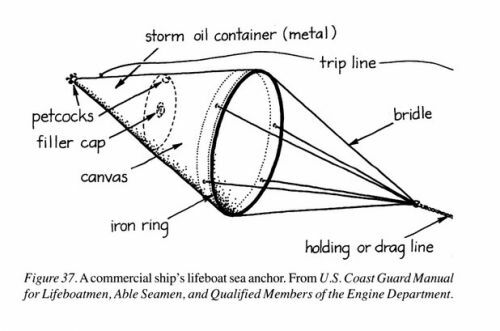 The lifeboats carried by the Titanic fell under British Merchant Shipping Act of 1894 that required carriage of “oil for use in stormy weather.” The USCG regulations also used to require that lifeboats be equipped with storm oil. What? How does spilling oil help you in a lifeboat? 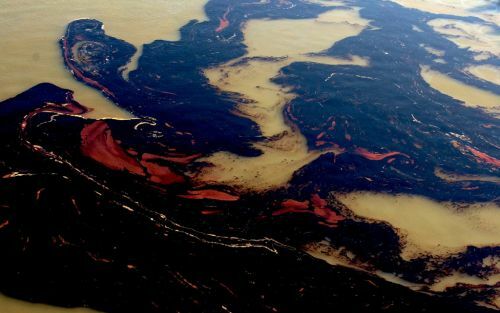 One of the behaviors that makes oil hard to clean up — its ability to spread rapidly into thin layers — has the effect of reducing the wave height and breaking waves. This is also why spilled oil becomes a “slick”. Oil spilled on the water absorbs energy and dampens out the surface waves making the oil appear smoother or “slicker” than the surrounding water. U.S and international regulations no longer require equipping life boats with storm oil. The requirement was removed in 1983, the same year the United States Coast Guard replaced open lifeboats with the requirement to carry fully and partially enclosed lifeboats. By Doug Helton, NOAA's Office of Response and Restoration Incident Operations Coordinator. Philosophical Transactions 1774:64 pp 445-460. 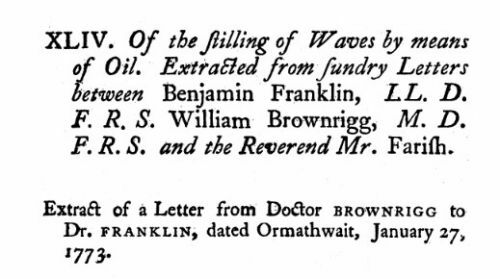 Published January 1, 1774.